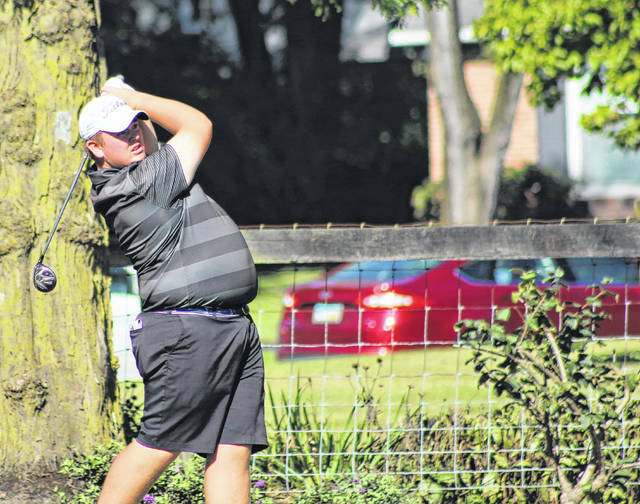 Trey Rath, an Olentangy Liberty graduate, competes at the OHSAA State Golf Tournament last fall at OSU. Anytime you make the final day of the Ohio Amateur Championship — a four-day event with cuts after the second and third rounds — you did pretty well for yourself. Such was the case for Grant Godfrey and Trey Rath, a pair of local standouts who did big things in high school and continue to make plenty of noise at the next level. Godfrey, a Delaware Hayes graduate and current Toledo Rocket golfer, moved up the leaderboard as the event wore on. He fired a 74 in Tuesday’s opening round at Wedgewood Country Club, collecting five birdies to close in the top third of the 144-player field. Godfrey moved up a few spots with another five birdies in Wednesday’s second round, carding a 72 to make the cut by five strokes. He fired a consistent round Thursday as well, with his 73 good enough to help him make the final day by three shots — a final round in which he shot a 73 to finish with a combined 292 and close tied for 14th. The top-15 showing was Godfrey’s second in as many years, meaning he’s once again exempt for next year. He finished tied for second last summer. Rath, who graduated from Olentangy Liberty in the spring and is off to play for Xavier in the fall, didn’t finish the way he would’ve liked, but shot so well in the first three rounds he still managed to finish tied for 33rd. He carded a first-round 71 — a mark just three strokes off the day’s low — to close toward the top of the leaderboard through 18 holes. He shot a second-round 72 and a third-round 74 to stay in contention for a coveted top-15 finish, but ran into some trouble in Friday’s final round. He shot a 79 to close with a combined 296. Kyle Mitchell and Cole Corder, a couple more Liberty grads, also competed in the event. Mitchell survived the first cut, but not the second, finishing with a three-round total of 226. Corder, meanwhile, finished with a two-round total of 158 before being cut after the first two days.